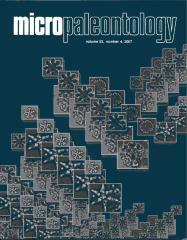 ABSTRACT: Free specimens of small foraminifers are not commonly reported from Permian strata. A foraminiferal fauna with free tests accompanied by abundant radiolarians has been discovered from uppermost Permian, upper Changhsingian strata in the Liuqiao Section, southwestern Guangxi Zhuang Autonomous Region, South China. SEMmicrophotography and thin sections of free specimens were both used for the study of external and internalmorphological features. In most cases the wall structure is not preserved because of recrystallization, however,most species could be identified based on test morphology. Twenty species (six new) of fourteen genera (one new) have been identified. The new genus and new species are: Dalongella n. gen., Dalongella fusiformis n. gen. n. sp., Glomospirella? mamilla n. sp., Glomospirella? curva n. sp., Hemigordius? yini n. sp., Geinitzinita changhsingensis n. sp. and Pseudolangella costata n. sp. The composition of this fauna is quite different from similar age small foraminiferal faunas reported from South China. Furthermore, the presence of radiolarians and cool-water brachiopods probably implies that the fauna is from a deep-water environment.